Gandalf the Grey gives his life in battle against the Balrog, giving the Fellowship of the Ring time to escape. Weeks later, Frodo Baggins and Samwise Gamgee continue their journey to Mordor to destroy the One Ring and, with it, the Dark Lord Sauron. 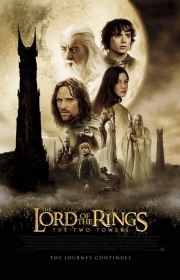 One night, they are attacked by Gollum, who bore the Ring for centuries before losing it to Frodo's uncle Bilbo, and who now seeks to get it back. Frodo and Samwise capture Gollum, but Frodo takes pity on him, understanding the burden of the Ring. Requiring a guide, Frodo persuades Gollum to lead them to Mordor. Sam, however, despises Gollum on sight and warns Frodo that the wily creature will betray them. In Rohan, Aragorn, Legolas and Gimli pursue the Uruk-hai, who have taken Merry and Pippin prisoner. Meanwhile, King Théoden of Rohan has been entranced by Gríma Wormtongue, who is secretly in the service of Saruman. Incited by Saruman, Orcs and Wild Men of Dunland lay siege to the lands. Gandalf the Grey gives his life in battle against the Balrog, giving the Fellowship of the Ring time to escape. Weeks later, Frodo Baggins and Samwise Gamgee continue their journey to Mordor to destroy the One Ring and, with it, the Dark Lord Sauron. One night, they are attacked by Gollum, who bore the Ring for centuries before losing it to Frodo's uncle Bilbo, and who now seeks to get it back. Frodo and Samwise capture Gollum, but Frodo takes pity on him, understanding the burden of the Ring. Requiring a guide, Frodo persuades Gollum to lead them to Mordor. Sam, however, despises Gollum on sight and warns Frodo that the wily creature will betray them. In Rohan, Aragorn, Legolas and Gimli pursue the Uruk-hai, who have taken Merry and Pippin prisoner. Meanwhile, King Théoden of Rohan has been entranced by Gríma Wormtongue, who is secretly in the service of Saruman. Incited by Saruman, Orcs and Wild Men of Dunland lay siege to the lands. Théoden's nephew Éomer accuses Gríma of being a spy; Gríma has him banished for undermining him. Éomer sets forth to the countryside to gather the remaining loyal men of the Rohirrim. Éomer's army later ambush and kill the Uruk-hai holding Merry and Pippin. Merry and Pippin flee into Fangorn forest and meet Treebeard, the oldest of the Ents. Frodo, Samwise and Gollum traverse the Dead Marshes, evading a Nazgûl. Upon reaching the Black Gate, they find it closed and guarded by Orcs. Gollum convinces the pair that attempting to enter the gate will lead to their capture, offering instead to lead them to an unguarded entrance. After being informed by Éomer of his ambush against the Uruk-hai, Aragorn, Legolas and Gimli find Merry and Pippin's trail. The trio are confronted by Gandalf, reborn as Gandalf the White after dying in battle. Gandalf joins with the trio as they journey to Edoras. After arriving, they free Théoden from Gríma's spell. Théoden decides to move his people to the stronghold Helm's Deep for safety. Fearing Helm's Deep will not survive, Gandalf leaves to find Éomer and his forces. Gríma flees to Orthanc and informs Saruman of a weakness in the outer wall of Helm's Deep. Saruman dispatches his army to the stronghold. Meanwhile, Gollum struggles with his loyalty to Frodo and his consuming need for the Ring. When Samwise and Frodo are captured by Rangers of Ithilien, Frodo reveals Gollum's presence to spare his life; Gollum nevertheless feels betrayed, and begins plotting against his new "master". As Théoden's forces travel to Helm's Deep, they are attacked by Saruman's Warg riders and Aragorn is thrown from a cliff and believed to be dead. In Rivendell, Elrond convinces his daughter Arwen to abandon her love for Aragorn and leave Middle-earth with her fellow Elves. Learning of Frodo's Ring, the Rangers' captain, Faramir, orders that it be sent to Gondor. In Rohan, Aragorn washes up on a river bank and makes his way to Helm's deep. In Fangorn Forest, Merry, Pippin, Treebeard and other Ents hold a council to decide on the role of the Ents in the war with Saruman. The battle of Helm's Deep begins between the Uruk-Hai and Rohirrim with Aragorn and his companions. Explosives are used against the weakness in the wall, allowing the Orcs to breach the fortress. In Fangorn, Treebeard and the other Ents initially refuse to get involved in the war until Pippin shows them that Saruman has decimated the forest; enraged, Treebeard commands the Ents to seek vengeance. Aragorn leads Théoden, Legolas and the remaining Rohirrim to attack the Uruk-hai army, allowing the Rohirrim's women and children to escape into the mountains. Gandalf appears, accompanied by Éomer and his men. The combined forces cause the Uruk-hai to flee into Fangorn, where the Ents and their Huorn allies attack them. At Isengard, the Ents destroy the Uruk-hai and release the river dam, drowning the surviving Orc defenders, flooding Isengard, and stranding Saruman in his tower. In the East, Faramir has the Hobbits taken to Osgiliath. Faramir's forces are attacked by Orcs led by a Nazgûl. With the aid of Sam and Faramir, Frodo escapes the Nazgûl's attempt to capture him and the Ring. Frodo momentarily succumbs to the Ring's influence and attacks Sam, but comes to his senses when Sam tearfully reminds him of their friendship. The Nazgûl is defeated and flees. Faramir frees the Hobbits and sends them on their journey, joined by Gollum. Gandalf remarks that Sauron will seek retribution for Saruman's defeat, stating that hope now rests with Frodo and Sam. At that same moment, Gollum vows to reclaim the Ring, and plans to have "her" kill Frodo and Sam. Whole or part of the information contained in this card come from the Wikipedia article "El Señor de los Anillos: las dos torres", licensed under CC-BY-SA full list of contributors here.